About a third of students begin college expecting to major in a STEM discipline – science, technology, engineering and math. Less than half of them manage to leave with a STEM degree. At some point, most students switch to an easier major. A couple of years ago UCLA released a study that broke down by race and ethnicity just how difficult it is to obtain these degrees. For instance, among white and Asian-American students, who were freshmen in 2004, only 24.5% and 33% of them had earned a college degree in a STEM major within four years. Engineering Degrees: How Tough Is It To Get One? As if the STEM subjects aren’t hard enough, professors are discouraging students from persevering with these majors because of the way they teach them. For the first couple of years and sometimes longer, math, science and engineering classes are typically delivered up in large lecture halls. I was encouraged today, however, when I read an article by a higher-ed writer at the Washington Post who talked about how STEM departments at some universities are ditching or modifying the lecture as a style of teaching. The Post article, mentioned universities which have joined the anti-lecture movement in its backyard. When you are evaluating universities, it’s always wise to get a sense of what the size of classes will be, particularly in a student’s intended major. You also want to obtain an idea of how committed a school is to its undergraduates, who often get short shrift at research universities. Of course, one way that students can avoid nearly all lecture-hall classes is to attend a college instead of a university. By their very nature, colleges are smaller and their focus is on undergrads — not professor research and the education of PhD candidates. Last fall my son, who attends Beloit College, told me that there were a lot of kids in his real analysis (math) class. On parent weekend my husband and I got to sit in on his math class, which is taught by Ben’s favorite teacher, and I counted the number of students. There were just 21 students. Only at a liberal arts colleges, would a teenager think that a class with less than a two dozen students is large! Lynn O’Shaughnessy is the author of The College Solution and she also writes a college blog for CBSMoneyWatch. Follow her on Twitter and Facebook. 2 Responses to The Rise of the Anti-Lecture? 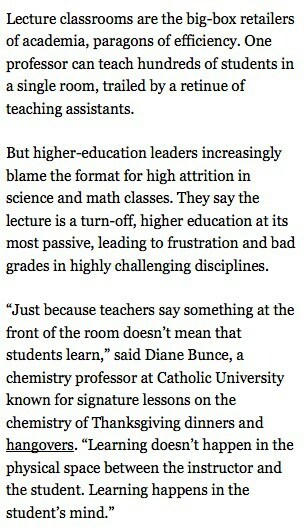 It’s not just the lecture format but the fact that they are “weed out” classes. I started off in engineering and you always heard some variation of “look at the person next to you, they won’t be here next semester.” The lecture format just adds to the process. And they have to weed them out otherwise the upper division classes would be too big or they would have to hire more faculty. There are plenty of students with the ability to be engineers, they just aren’t able survive the process that is designed to get them to leave. Excellent point. So true. I think it’s despicable that universities do this. That’s one reason why I suggest that would-be engineering students consider a 3-2 program with a liberal arts college. You go three years to a liberal arts college and typically major in physics or chemistry and then transfer to an engineering program — two popular ones are at Columbia U. and Washington University in St. Louis. I talked to the 3-2 coordinators at both of these schools and they raved about their liberal arts transfers.